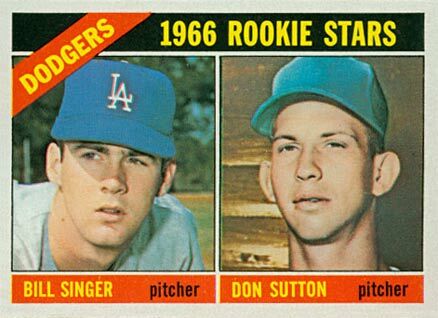 Led by rookie cards for three Hall of Fame pitchers, 1966 Topps Baseball is largely associated with Jim Palmer, Don Sutton and Fergie Jenkins. 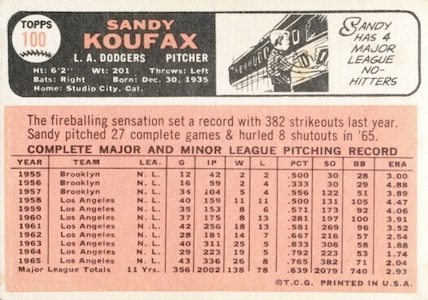 Also of note, '66 Topps marks the final active releases for baseball greats Sandy Koufax and Robin Roberts. 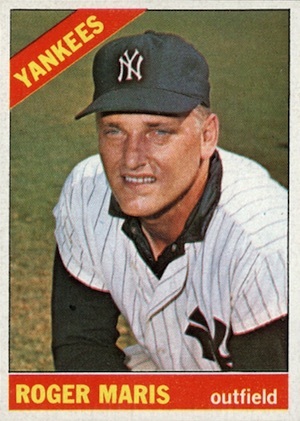 Shop for 1966 Topps Baseball cards on eBay. 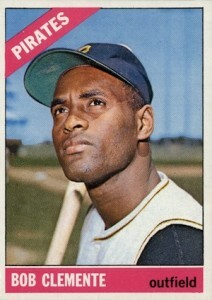 1966 Topps Baseball continues the standard sizing and mirrors the checklist of the previous year with 598 cards. Topps photographed the players in the set from a wide variety of different angles and poses. Action photos, upper-body images and head shots are the most common. 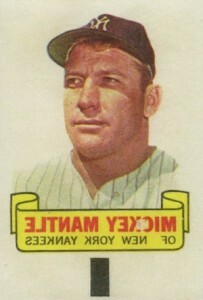 In addition to the player photo, the front of the 1966 Topps Baseball cards are adorned with the team name in a diagonal stripe along the upper left-hand corner. The player's name and position are highlighted in a bar across the bottom. While the backgrounds showcase a seemingly random mix of color, 1966 Topps Baseball utilizes a team-specific scheme that is detailed below. 1966 Topps Baseball card backs feature a pinkish color and the customary biographical information, statistics and cartoon. While most cards are relatively filled by the list of season-by-season stats for the subject, less-seasoned players also include a short paragraph. As is normally the case with these vintage sets, the high-number series cards (#523-598) can be more difficult to find, particularly in high grade condition. With over half the final series labeled as short prints, several Hall of Fame cards receive addition interest, including Willie McCovey (#550), Billy Williams (#580) and Gaylord Perry (#598). 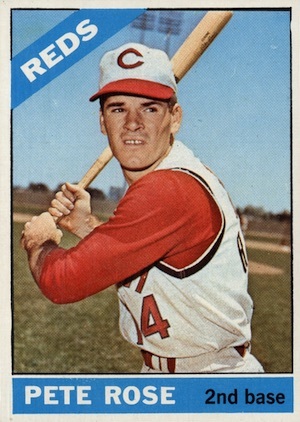 On the other hand, key base cards for Pete Rose and Mickey Mantles are actually double prints in the earlier series, but are still among the most valuable cards in the release. 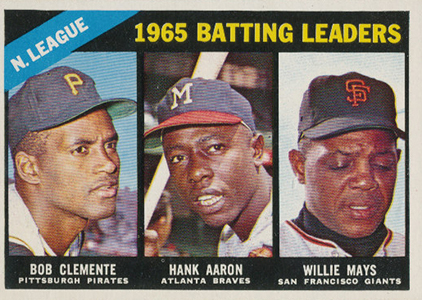 Despite an abundance of cards in the base set, League Leaders (#215-226) are the one true subset in 1966 Topps Baseball. Collectors can also find Rookie Star combos, Topps Rookie All-Stars, veteran All-Stars, team cards and checklists randomly scattered in the checklist. 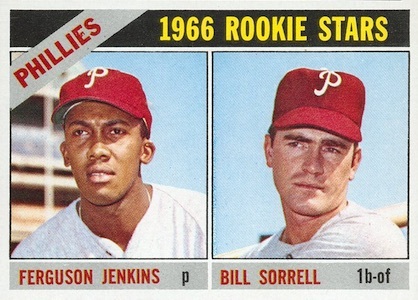 Like the earlier 1960s sets from Topps, most of the key rookies are found on the multi-player Rookie Star cards. 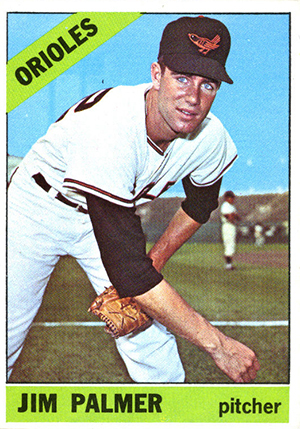 While this is also the case for Don Sutton and Fergie Jenkins in 1966 Topps, Jim Palmer is treated to a single-player card. 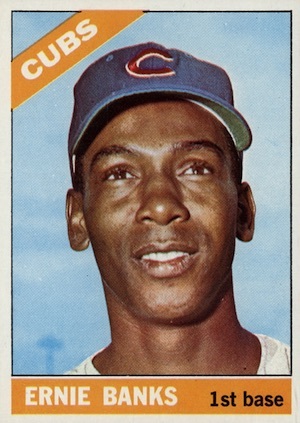 1966 Topps Baseball does contain a handful of variations and uncorrected error cards. Although none of the 11 variations carry a particularly steep premium, completing a master set will take more work. Don Landrum (#43) actually has three versions due to a pants-related wardrobe malfunction and multiple attempts to correct it. Several of the other variations are related to offseason trades that were not originally reflected on the cards. The presence of these variations brings the 1966 Topps Baseball master set count to 609 total cards. 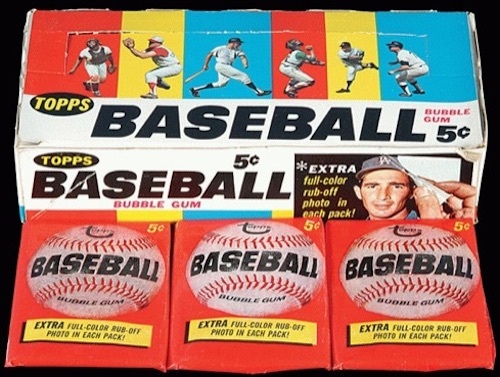 Topps Rub-Offs act as the primary insert set in 1966 Topps Baseball. The primitive temporary tattoos include 120 total cards, with pennants for each team. The 2" x 3" Rub-Offs are not numbered. Hank Aaron, Roberto Clemente and Mickey Mantle are the key options. The most common condition issue specific to the set is centering and mis-cuts. This can present a significant challenge when chasing the star and rookie cards in high-grade condition. 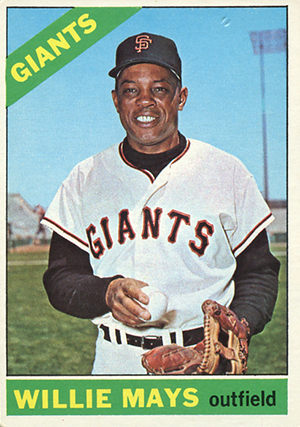 The first and last cards in the set (Willie Mays and Gaylord Perry) also suffer from the typical issues common for their placement on the checklist, pushing values. 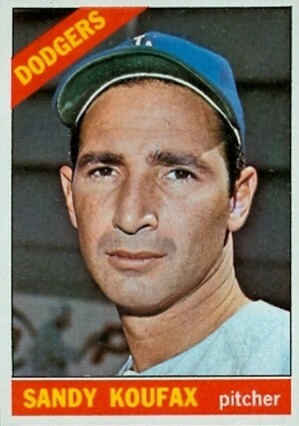 Continuing a theme found in several other Topps Baseball sets of the era, there is a Venezuelan version of the 1966 Topps Baseball set. These are more rare and valuable than their standard American counterparts. The cards are printed on noticeably thinner card stock and are often found with paper loss on the card backs as a result of being mounted in albums. Covering a larger portion of the set than previous editions, the Venezuelan issue consists of cards #1-370. 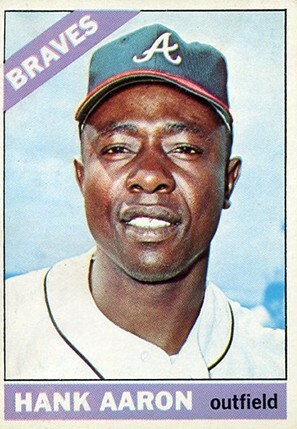 Additionally, 1966 O-Pee-Chee also acts as a quasi-parallel of the 1966 Topps Baseball set. However, the Canadian issue only covers the first 196 cards in the main set. The most obvious difference is the "Printed in Canada" listing on the back. Although not as scarce as the Venezuelan issue, the OPC set is still much more limited than the main '66 Topps Baseball set. 598 cards. Shop for base sets on eBay. 120 cards. The cards not numbered. They players are listed in alphabetical order by last name and followed by the pennant cards. 1966 Topps Rub-Offs Tom Tresh – PSA 9! Yankees! 1 9! I like everything about the way you set it up. A very challenging alternative to the standard US set. Tough to find in EXMT or higher condition, makes one appreciate VGEX and EX. For those who love Topps it’s a great way to bring uniqueness to Topps collections. One of my favorite sets from the 1960’s, the 1966 Topps set is a very difficult set to complete, with cards from the last series (#523-598) very tough to find. 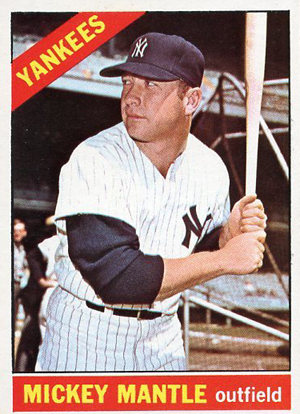 Fortunately, I completed the 1966 set sometime in the late 1980’s, and it was a very challenging set to complete even then, at a time when old baseball cards were a lot cheaper back then.